Boat Covers Direct® is proud to offer Universal Wakeboard Towers made by Monster Tower. Since 2002 Monster Tower has built over 50,000 towers for satisfied customers. 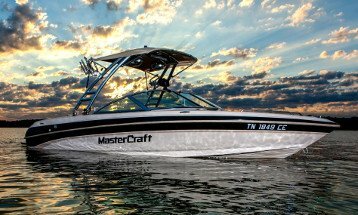 Monster Tower Aftermarket Wakeboard Towers are designed to fit virtually any boat with a full line of universal accessories to match, giving you the lift and versatility you want at a price you can afford. All towers with the exception of the HS1 are built with 2.5" 6063-T6 aircraft-grade anodized aluminum; providing superior strength, a beautiful finish and superior corrosion resistance. The strength and stylish lines of each tower design will give you solid pulls for years to come while enhancing the look of your boat. A forward facing ski tower featuring both style and versatility. Designed to fit all boats longer than 16' and 72"-102" wide. Resilient assets include 2.5" aluminum construction and dual top supports for additional accessory mounts. Perfect for the beginning boater, the MTE is our most economical tower option without sacrificing the versatility and strength of the tower. Boasting foldable legs, quick release front mounts, and curved mount capabilities; this tower is suitable for most any boat with a beam between 60"-102." The "Original". Monster's first universal-fit wakeboard tower. The MT1 is known for its versatility and durability. Constructed with 2.5" aluminum, stainless steel heim joints and zero torsion mounts. Available in multiple finishes this tower will fit all boats with a beam width of 60"-102". Designed for boats with higher windshields and skilled riders, the MT2 features 3 extra inches of height and a longer front tower leg. Anodized and polished aluminum offer a strong frame with Quick Release Mounts, Zero Torsions Mounts and a Swivel Tow Point. Bundle and save! This package includes your choice of Monster Tower and any two wakeboard tower racks by Monster Tower. You can also add an optional tower bimini top, made from marine grade Sunbrella acrylic. Bundle and save! This package includes your choice of Monster Tower, any two wakeboard tower racks, and a pair of single barrel speakers made to attach to your wakeboard tower. You can also add an optional tower bimini top, made from marine grade Sunbrella acrylic. Bundle and save! This package includes your choice of Monster Tower, any two wakeboard tower racks, and a pair of double barrel speakers made to attach to your wakeboard tower. You can also add an optional tower bimini top, made from marine grade Sunbrella acrylic.